T.O. is not one of my favorite athletes ever, but I like him a whole lot better than Rodney Harrison. T.O. took to twitter to lash out at Harrison’s comments about his no-catch performance against the Saints. Harrison called T.O. a “Clown” and said that he was “more concerned with his own stats, rather than the teams”. T.O. responded to these statements via twitter. Clearly there is going to be more outbursts by both parties because neither one will let the other get the best of them. Owens has to focus on football and Harrison needs to realize he isn’t playing anymore. 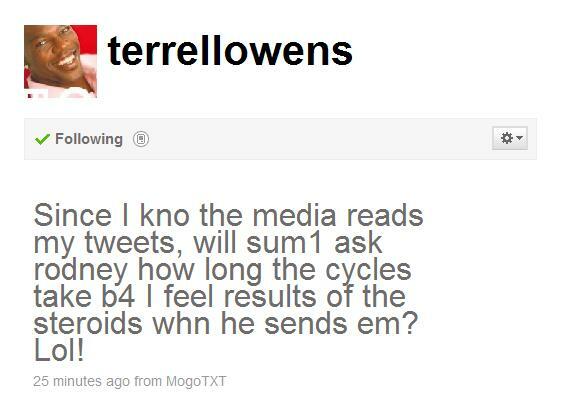 He also has to realize that his comments will weigh a lot more heavier on his job than T.O.’s. 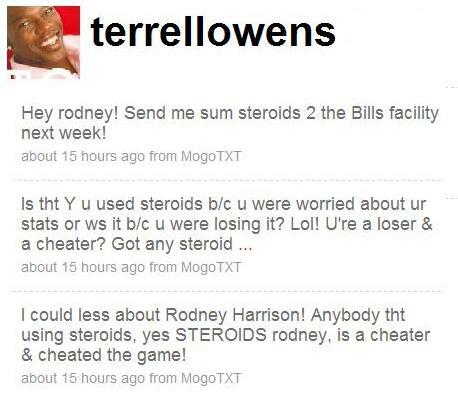 I wouldn’t be surprised if Owens is reprimanded for his tweets and Harrison is told to cool it at NBC. You are currently browsing the archives for the Feud category.